Plywood Keeler chair in Beech with further colours available on request. Tabletop in Formica finishes with an MDF or Laminate edge. Heavy duty steel tubular frame in a choice of ERP paint finishes. 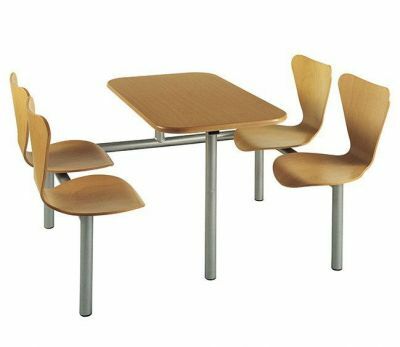 Classic design fast food furniture range seating up to six people at a time. The unit includes carefully moulded seating for better comfort. Released from stock with a lead time of approximately 15-20 working days from order.